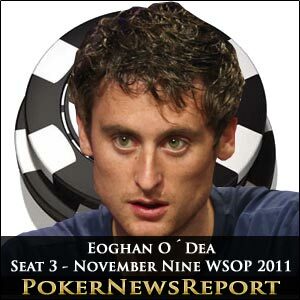 Eoghan O´Dea hails from Dublin and is the son of Donnacha “The Don” O´Dea – who cashed 23 times in WSOP events including six times in the Main Event and twice featured on the final table. Eoghan (pronounced “Owen) is already no stranger to WSOP success – his final table appearance in this year´s Main Event is his fourth cash of the season – and his final table appearance has brought his a lucrative sponsorship deal from Irish bookmaker Paddy Power. Eoghan started Day 8 of the WSOP Main Event in July with a healthy chip stack of 19 million and in second place behind Anton Makiievskyi. The strength of his stack enabled Eoghan to take down several large pots uncontested, and he cemented his position neat the top of the leaderboard with the elimination of Scott Schwalich (14th), before taking the chip lead with the elimination of Konstantinos Mamaliadis (13th) and Brian Devonshire in twelfth. A couple of run-ins against Phil Collins allowed Martin Staszko to grab the final table lead, but Eoghan´s elimination of John Hewitt in tenth enabled him to build his chip stack back up to 33,925,000 for a healthy second place at the final table. What´s Eoghan Been Doing Since? Eoghan has been busy since July following the tour around Europe (Partouche Poker Tour/EPT London/WPT Malta/WSOPE Cannes) and, with the exception of Matt Giannetti has been the most successful of the nine – final tabling the WSOPE €5,000 Pot Limit Omaha Event for $28,348. He has also been busy with his commitments to his new sponsor – Paddy Power Poker – which included a “warm up” last weekend at the Irish Winter Festival Main Event. Whatever happens on Sunday, Eoghan is assured of breaking into the top 5 of Irish poker players based on his lifetime´s earnings (and possibly all future articles about Eoghan will not start with the line “son of Donnacha”). Our guess is that he will go further than Sunday, and appear among Tuesday´s final three players in the battle of the 2011 WSOP November Nine. He has already proven he has the temperament for a big occasion such as this, and is not afraid to fire out the bullets when he believes the time is right. Phil Collins will have immediate position on him once again, but the next three seats at the table are occupied by the three short-stacks, and Eoghan will probably use this to his advantage.